Rose & Thistle is a proud 2016, 2017, and 2018 sponsor of Dining Out For Life, a charity benefiting people living with AIDS and HIV. Thanks to participants in 2016, together we provided five priceless nights of safety and round-the-clock assistance for a parent or child in Raphael House's shelter! How many nights can we cover this year? We also took part in the annual "Restaurants for Raphael House" fundraisers in 2017 and 2018. Halloween is always a good time when Born Cosmic is in the house! Even though we're a Scottish pub, we still know how to celebrate St. Patrick's Day! For this right special day, we serve corned beef and cabbage with potatoes. Guinness available on tap, of course. 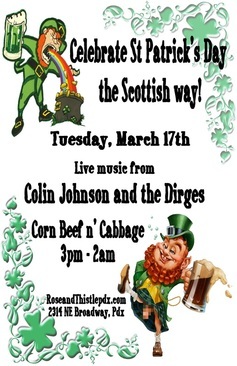 Special guests Colin Johnson, Sarah Vitort, Gabby Holt, and The Mossy Merkins will supply live music beginning at 7:30 pm. Join us for a different kind of Valentine's Day celebration: No Way V-Day. 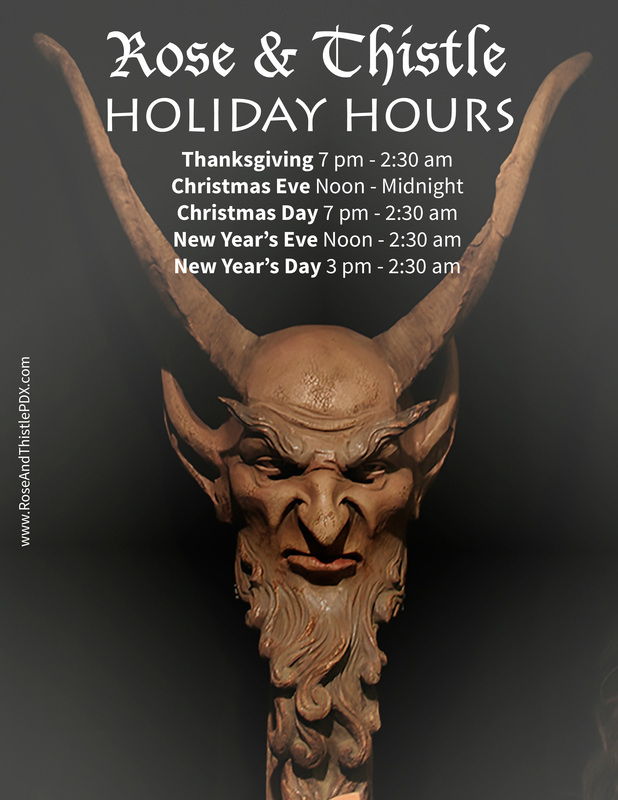 Hallmark Holiday haters will enjoy food and drink specials (ask for the "Beef Curtains" and make it a double!). Enter to win prizes from Fantasy For Adults Only and Rose & Thistle by checking in on Facebook (make it public! ), clicking "join" on our event page, or posting a photo on Instagram (@RoseAndThistlePDX). Use hashtag #MoistRatLove. Each post, check-in, or join equals one entry. Contest ends February 15th. Check our Facebook page on Monday, February 16th to see if you won! We had a benefit bash on October 31, 2014 for dear Christa, who is suffering from Hodgkin's Lymphoma. We were able to raise over $2,000 to help offset her medical bills. Live bands Glassbones, Walking Stalking Robots and Born Cosmic performed. Donate here if you were unable to attend and would still like to contribute. Thanks to dining participants on October 23, 2014, Rose & Thistle raised over $200, benefiting Portland Women's Crisis Line and West Women's and Children's Shelter.